An ambitious new addition to DK’s excellent science series that includes titles on genetics, mathematics, physics and economics. Professor Winston takes the reader on a tour of the brain, explaining how it works and exploring behaviour, intelligence, emotions and the senses. The brain is the most complex but also the most mysterious organ in the body, and each one is unique. Winston describes it as ‘the miracle of evolution, making each of us what we are’. The book explains the physical structure of the brain, the billions of neurons it contains and the intricate maze of electrical currents that flow from it. Sections that follow explore consciousness, personality, emotions, mood, sleep and memory. 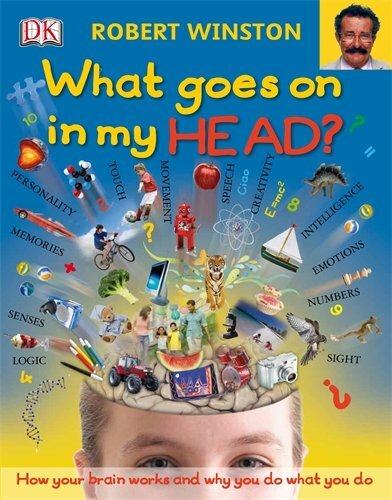 Complex ideas are brought to life through imaginative diagrams and photographs, and throughout the book there are brain teasers, visual puzzles and practical tests to try out with friends. Robert Winston belongs to that rare breed of scientists who combine academic brilliance with a flair for communication. The partnership with DK’s design skills makes this an accessible and fascinating introduction to neuroscience and psychology.